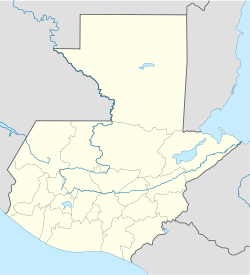 Chimaltenango is a town in Guatemala of some 743,000 people (as of 2018). It serves as both the capital of the department of Chimaltenango and the municipal seat for the surrounding municipality of the same name. Chimaltenango stands some 35 miles west of Guatemala City, on the Pan-American Highway. The municipal capital produces textiles and pottery and is also the home of the Rose Education Foundation, a non-profit organization working to make educational opportunities available to children living in rural areas in Guatemala. Teacher Natalia Górriz de Morales. Photograph from La Ilustración Guatemalteca. In Pre-Columbian times what is now the city of Chimaltenango was known to its native inhabitants as B'oko' . Like many other cities in the area, the Spanish Conquistadores used the name given by their Nahuatl speaking allies from central Mexico. The Nahuatl name was Chīmaltenānco, meaning "Shield City." The current town was found in 1526 by Spanish conquistador Pedro de Portocarrero, and shortly after it was assigned by bishop Francisco Marroquín to the Order of Preachers, along with Jocotenango, Jilotepeque, Sumpango, Candelaria, Amatitlán, Petapa, Mixco and Pinula. The general areas with under the jurisdiction of "Valle de Pasuya" (English: Pasuya Valle) in those days, which had nine valleys, among them the Chimaltenango Valley; this valley bordered with Xilotepeque valle on the northwest, with Mixco valley on the East, with Guatemala on the North and with Sololá Prinvice on the West. Furthermore, the Valle of Pasuya had to mayor municipalities: Chimaltenango —which covered Chimaltenango, Xilotepeque and Alotenango valleys—, and Sacatepéquez —which covered the rest. América de Chimaltenango football club has played the 2009/2010 season in Guatemala's second division. They play their home games in the Estadio Municipal de Chimaltenango. Natalia Górriz de Morales: teacher. She was the director of "Instituto Normal Central para Señoritas" (English:Normal Central Institute for Girls) and Elementary School Inspector during general José María Reina Barrios presidency; married to then-minister of Economy, colonel Próspero Morales,who in 1897 resigned his position and raise on arms as one of the leaders of the Quetzaltenango Revolution against his former boss, after general Reina Barrios tried to extend his presidential term until 1902 even after the sound failure of the Central American Expo and the acute economic crisis that Guatemala was mirred in. After the Reina Barrios murder in February 1898, Morales ran for office in the 1898 presidential elections, but when he realized that those were rigged in favor of interim president Manuel Estrada Cabrera he tried to invade Guatemala from Mexico, but died in the attempt. Natalia Górriz de Morales then started teaching again and became one of the more representative women of the early 20th century in Guatemala. Chimaltenango has a subtropical highland climate (Köppen: Cwb). ^ "Partido UNE gana alcaldía de Chimaltenango". Prensa Libre (in Spanish). Guatemala. 8 September 2015. Retrieved 8 September 2015. ^ a b c La Ilustración Guatemalteca & 15 August 1896, p. 24. ^ Juarros 1818, p. 336. ^ a b Juarros 1818, p. 344. ^ Juarros 1818, p. 345. ^ Maudslay & Maudslay 1899, p. 42. ^ Macías del Real & 15 March 1897, p. 388. ^ "Climate: Chimaltenango". Climate-Data.org. Retrieved 19 September 2015. ^ a b SEGEPLAN (2010). "Municipios de Chimaltenango" (in Spanish). Guatemala. Archived from the original on 8 June 2015. Retrieved 8 June 2015. Juarros, Domingo (1818). Compendio de la historia de la Ciudad de Guatemala (in Spanish). Guatemala: Ignacio Beteta. La Ilustración Guatemalteca (15 August 1896). "Nuestros Grabados: Natalia Górriz de Morales". La Ilustración Guatemalteca (in Spanish). Guatemala: Síguere, Guirola & Cía. I (2). Macías del Real, A. (15 March 1897). "Resumen Quincenal". La Ilustración Guatemalteca (in Spanish). Guatemala: Síguere, Guirola & Cía. 1 (16). Maudslay, Alfred Percival; Maudslay, Anne Cary (1899). A glimpse at Guatemala, and some notes on the ancient monuments of Central America (PDF). London, UK: John Murray.